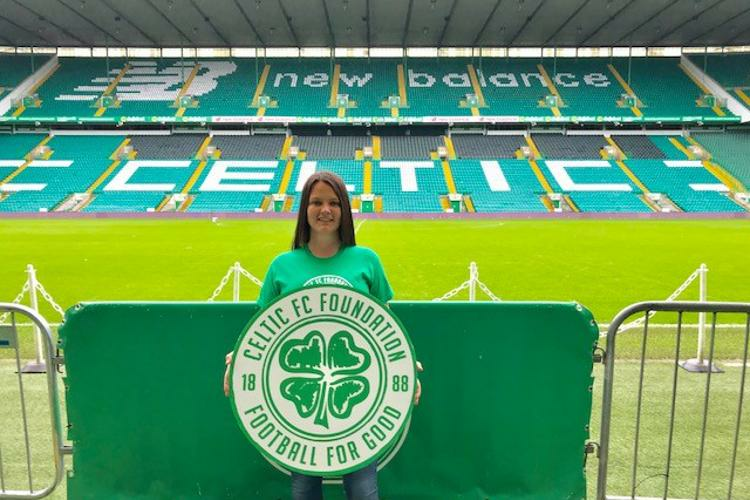 LIFELONG Celtic fan, Dannika Drain has participated in a variety of fundraising activities with Celtic FC Foundation over the past five years. From travelling to Malawi, to walking on fire, her commitment to supporting the work of the Foundation has been a constant. Next up for Dannika will be Celtic FC Foundation’s 2018 Ben Nevis Huddle, as she prepares to take on the challenge once again, having previously scaled Britain's highest mountain back in both 2013 and 2014. Dannika spoke of her involvement with Celtic FC Foundation and her excitement ahead of the Ben Nevis Huddle. She said: “This will be the third time I’ve taken on the Ben Nevis Huddle, having participated in the first two years. The 2013 Huddle was actually the first fundraising event for Celtic FC Foundation that I took part in. “When I was 17 I was in a bad car accident and I wasn’t sure if I’d actually walk again. Thankfully I made a full recovery and when I first saw the Ben Nevis Huddle advertised on the big screen at Celtic Park, I thought it would be a great way for me to challenge myself and prove that I could do it. “I had a great sense of achievement after completing it that first time and that gave me the drive to do it again in 2014 and I managed to convince a few family members to join me. This time around there’s a group of 10 of us from my supporters’ bus all taking part, so it’s going to be great. “Since the first Ben Nevis Huddle, I’ve participated in various Celtic FC Foundation fundraising initiatives and it’s the work of the Foundation that makes me so keen to stay involved. Dannika and the rest of the group are hoping to raise as much as possible and have already exceeded their initial fundraising target. The Ben Nevis Huddle 2018 will take place on Saturday, June 30 and participants will start the climb from the Glen Nevis Visitor Centre, following the Mountain Track route. Groups will leave the centre dependant on fitness levels to allow as many people as possible to meet at the top for the Huddle at 1pm. All we ask is that you commit to raising a minimum of £130 (after entry fee) for Celtic FC Foundation. Registration is now open and you can sign up HERE. Places are limited and will be allocated on a first come, first served basis. The non-refundable registration fee is £30 per person. Please ensure you read the FAQs download and TERMS AND CONDITIONS download thoroughly before registering. To complement our Ben Nevis Huddle event, our Irish-based supporters will have the opportunity to get involved in the brand new supporter-led Slieve Donard Huddle, which will take place on Saturday, June 2. Participants will climb 2,789ft to the summit of Slieve Donard in County Down and take part in a Huddle to raise funds for Celtic FC Foundation. To register your interest, please contact Micky McGurk of Eire Go Brach CSC at micky_mc_gurk@hotmail.com or on 07763685028.